The smashed front end of a Mattapan High Speed MBTA Trolley near Cedar Grove Station. The most serious incident occurred on the Mattapan line when two trolleys collided in the Cedar Grove section of Dorchester shortly after 3 p.m. Friday. 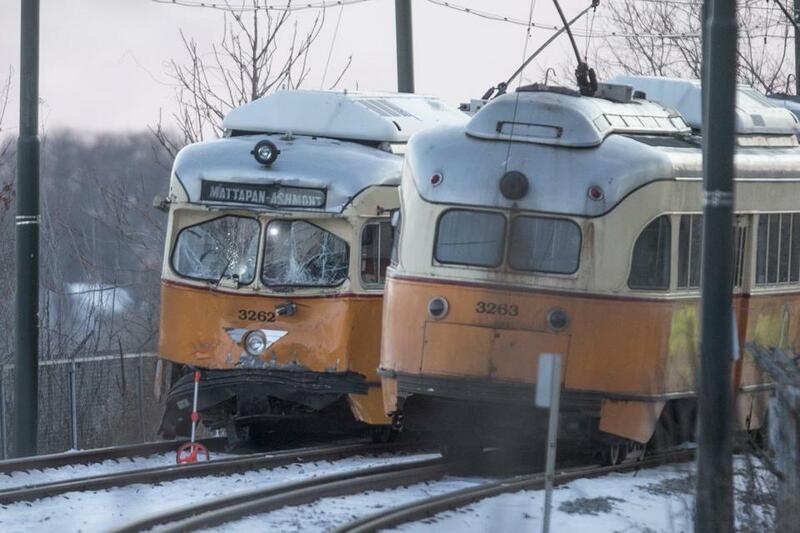 Both trolleys were traveling on the same track in the same direction, and one apparently rear-ended the other, said Boston District 8 Fire Chief James Greene. Most of the injuries were minor, he said, “lacerations, head, neck, and back type of injuries.” Sixteen people were taken to hospitals. The collision between two trolley cars occurred after 3 p.m., according to authorities. 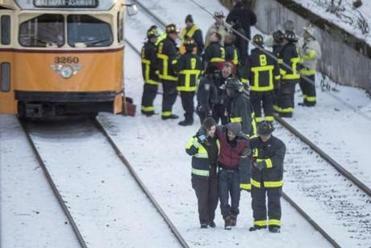 Although the accident is still under investigation, MBTA officials do not believe it was caused by the cold. However, with temperatures in the low single-digits, the rescue was complicated by the weather. Injured passengers limped through light snow to waiting ambulances, while the T replaced the stalled trolley service with shuttle buses for the afternoon. Another bus was brought in near the scene to give first responders and other workers a place to warm up. The severe cold was more clearly a factor in some of the other breakdowns that caused long delays during the morning commute, officials said. On the Orange Line, a portion of the track near Wellington station broke, and a train near downtown was disabled. 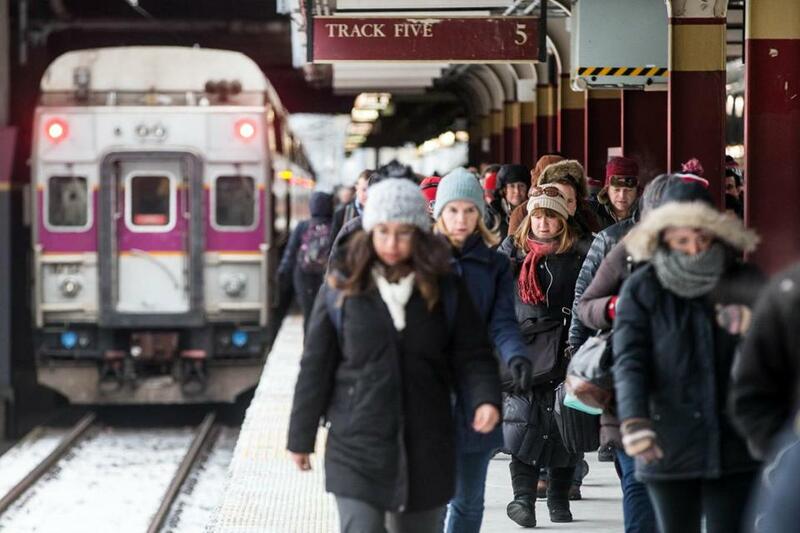 Similar track and vehicle problems rippled across the commuter rail network. And earlier this week the Red Line experienced big delays during the onset of the cold weather. Battle-weary MBTA commuters routinely experience delays of these sorts. But the effect of the delays was magnified by long waits in the extreme cold. “Forty minutes is a long time to stand outside,” grumbled Jamaica Plain resident Kyle Olliver, after languishing on the platform at the Stony Brook station. Just a few weeks ago, Governor Charlie Baker toured a commuter rail maintenance facility in Somerville and declared that the MBTA was prepared for winter. “Frankly, I’m looking forward to seeing what happens when the show starts,” said the governor, who has presided over a broad reform effort at the T since the 2015 service collapse. With a new oversight board installed by Baker after the 2015 problems, the MBTA has since spent more than $100 million upgrading parts of the system to better withstand snow and extreme cold, including heaters for track switches, new electrified third rail in some locations, and additional snow clearing equipment. MBTA deputy general manager Jeffrey Gonneville said the equipment that was fortified for cold weather experienced few serious issues. The T also had workers inspecting the system overnight to preemptively identify potential issues, and strategically deployed others across the system to respond quickly to problems. “Although it may not be completely apparent, there are a number of things that did work and go extremely well,” Gonneville said Friday. Nonetheless, he acknowledged that the holiday week had been challenging, despite dry conditions and light traffic because regular riders were on vacation. And most of those issues were a direct result of the weather. “When you have extreme cold or extreme hot conditions, no matter what railroad you’re running, your infrastructure is always going to be affected by that,” he said. The piece of Orange Line track, on a bridge over the Mystic River, broke because rail compresses in the cold, making it more brittle. The break was discovered around 5 a.m., and workers spent about four hours in “brutal conditions” fixing it, according to a T spokesman. As for another problem, the disabled Orange and Red Line cars, officials said the cars rely on air locking systems for braking, opening doors, and more. Moisture within those systems can freeze, however, causing the vehicles to malfunction. Commuters arrived at South Station in Boston in single digit temperatures. Gonneville said the disabled cars were older models, some dating to 1969, and that newer trains on the Green and Blue lines did not have the same weather problems. The MBTA is spending up to $843 million for more than 400 new Red and Orange Line cars that will be better equipped to handle the weather for two reasons: They will use electricity, rather than air, to power certain functions such as opening doors, and will have newer air systems that are less prone to moisture issues. Gonneville said there are two aspects to the T’s winter prep plans: preventing failures through investments in equipment and preventative maintenance, and responding to failures as they occur. But he acknowledged the T can respond better to breakdowns. For example, after passengers were left waiting in the cold for shuttle buses Friday on the northern end of the Orange Line, Gonneville said in the future the T could hold each departing shuttle bus until the next one arrives, so passengers do not have to wait outside in freezing temperatures. “By no means was it ideal, by no means were we happy or satisfied with that, and we are going to make the necessary changes,” Gonneville said of the issues this week. Danny McDonald, Mike Bello, Martin Finucane, Matt Rocheleau, Felicia Gans, and Emily Sweeney of the Globe staff contributed to this report.